The greatest blind superhero ever. Well, other than Ray Charles. 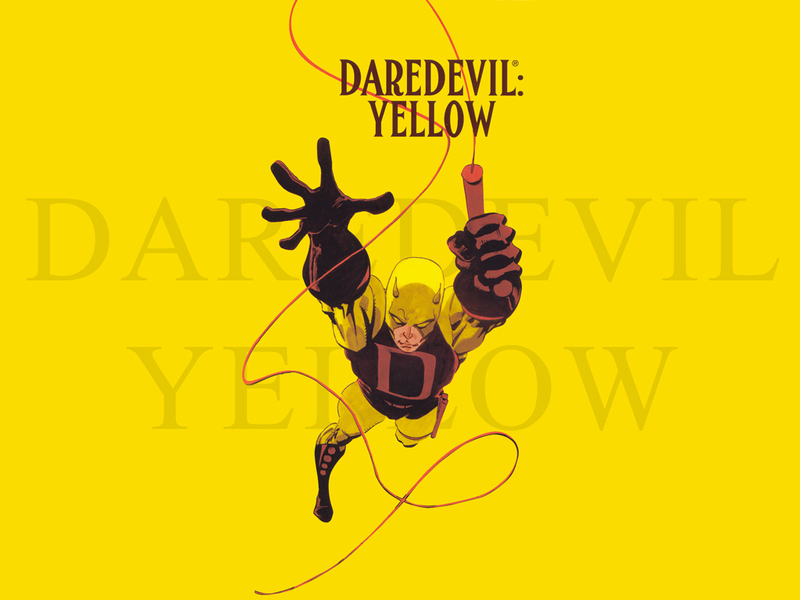 Daredevil is either Marvel’s most popular B list character, or he’s their least popular A list character. I’m not exactly sure which, but I’m leaning towards the latter. But while his popularity waxes and wanes, he’s been extremely fortunate from a creative standpoint, and we’ve been the beneficary of some pretty tremendous DD stories as a result. So why does this character seem to inspire so many great stories? A younger, happier Daredevil, painfully unaware of the lifetime of misery that awaits him. Spidey and Bats are by theirs. Maybe the key is that he’s more malleable than those two? He’s been written as the brooding vigilante, the righteous superhero, and the carefree wandering adventurer. And while all three have worked to some extent, it’s the version of him as fate’s eternal punching bag that has endured. He’s a blind lawyer named Matt Murdock. Yes, he’s really blind. He was struck by a container of radioactive waste as a child, which both blinded him and gave him super radar. Super radar? Yes. Sorry. He’s a whore. Seriously. He’s the Bill Clinton of the Marvel Universe. He’s fucked everybody except for maybe Sue Storm. And possibly Howard The Duck. Though I’m not sure about that one. The character was essentially a cheap knock-off of Spider-Man for the first 20 years of his existence, until Frank Miller took over the character in 1982. In fact, his book was on the verge of cancellation. Miller’s version is usually the one people think of, and it’s the version that the movie was based on. DD before Miller wasn’t exactly awful, but it was pretty average. Although firmly entrenched in the Marvel Universe, the character is often written as being slightly apart from it, and isn’t often part of the company’s huge semi-regular cross-overs. He’s Marvel’s premier “Street” hero, but he gets a little diminished when you put him beside Asgardian Thunder Gods. Bad things happen to him. All the time. He has the month that Japan is having EVERY SINGLE MONTH. It’s kind of his gimmick. Is that enough? I say it’s enough. Let’s begin. 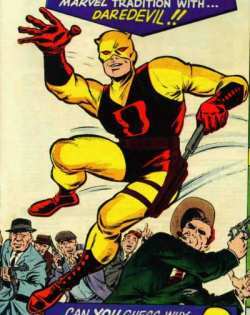 Like the X-Men, DD stands apart from his Marvel brethren by being one of the few characters that didn’t have great stories in the 1960’s. Or even the 1970’s. In fact, a strong case could be made that there were no great DD stories for the first 20 years of his existence. Harsh, but true. It wasn’t until a fresh-faced kid named Frank Miller first took over the art chores in 1982, and then the writing a few issues later, that the book actually took off. In fact, Miller’s run on Daredevil is now considered to be one of the very best superhero runs of the 1980’s. But does it deserve the hype? Absolutely. 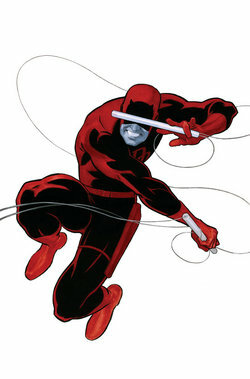 Miller transformed Daredevil like very few characters before or since, to the extent that his take on the character is now considered the definitive one. 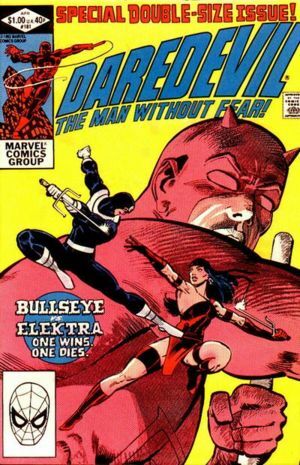 So many of the constants that are now considered part of the Daredevil canon came from his era (Elektra, Kingpin, Ben Urich), that it’s hard to imagine a Daredevil before Miller got his hands on him. Rereading this was an absolute pleasure. Seeing a young creator expand his horizons by leaps and bounds issue by issue is something that is seen so infrequently these days. From the minute Miller starts to write this book, you know that this is something special. It’s easy to mock Miller these days (Cough…The Spirit…cough), but there is a reason why he’s considered one of the preeminent storytellers in the comic business, and a big part of that reason is Daredevil. Miller’s run technically starts with him just as artist, and while those issues are strong (Roger McKenzie did the writing), it’s not until issue 168 that Miller fully takes over the title. And he gives us Elektra. And then he gives us the Kingpin as DD’s arch nemesis; Bullseye as truly terrifying psychopath; Ben Ulrich as tortured confidant; The Hand; Ulrich getting stabbed; One of the greatest death scenes in comic history. And so on. And it’s all done in a noir style that pays earnest tribute to Will Eisner’s Spirit, but never copies. In short, there’s brilliance here. The second half of the run isn’t quite as strong as the first, and there is some filler here and there. But all in all it’s a tour de force in visual storytelling. A panel from issue 227 of Daredevil. This is the beginning of the worst day of Matt Murdock's life. 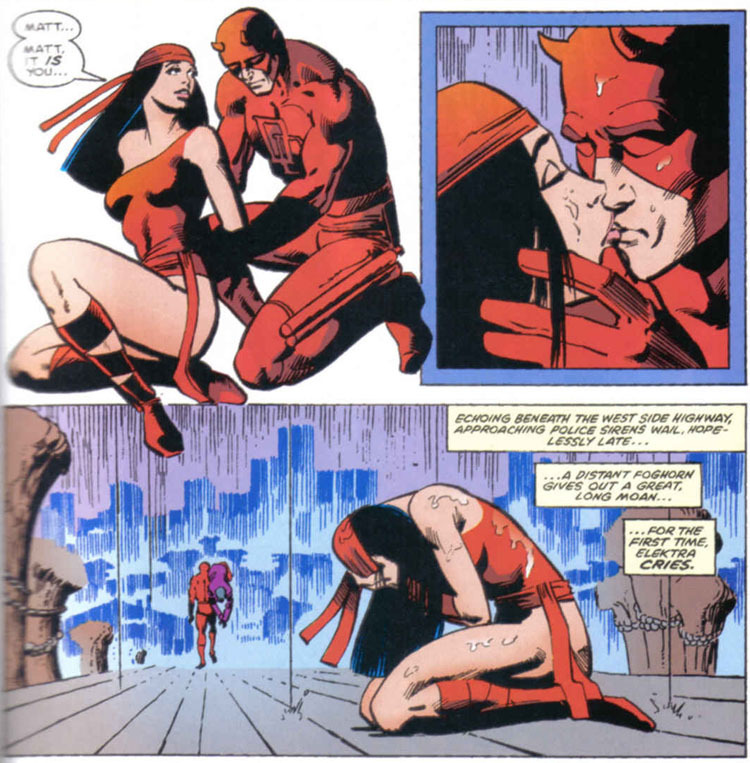 Until the next worst day of Matt Murdock's life. He's had a lot of worst days. 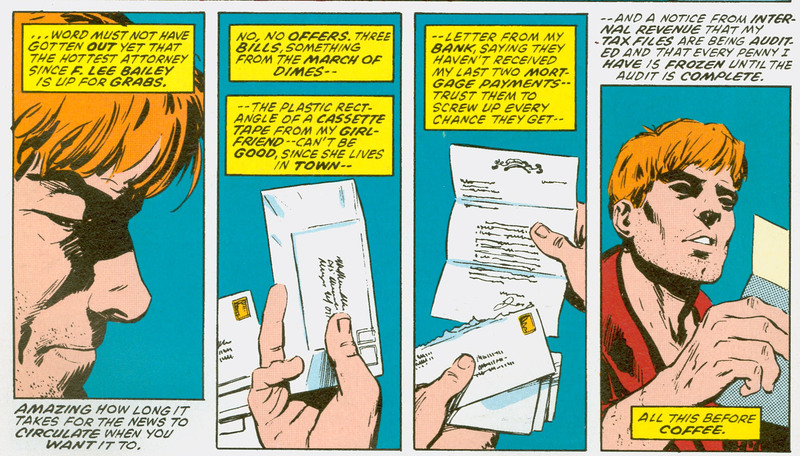 Although his original run is what gets most of the attention, it’s often forgotten that Miller came back to Daredevil a few years later, this time to handle the scripts, while David Mazzuchelli worked his magic with pencils. In my opinion, this arc is almost the equal of Miller’s original “Elektra” saga, though some would say that the ending isn’t as finite, or satisfying. All I know is that issue 227 of this series should be studied at comic book schools for decades to come when it comes to the “How to build enough tension to make a rat chew off his own tail” part of the course. It’s the story of a man being destroyed, piece by piece. And unlike most superhero stories, this one really did change the character forever. I can’t recommend these stories highly enough, and I was happy to see that they’ve only improved with age. This was a mini-series by the esteemed pairing of Jeph Loeb and Tim Sale. While they’ve received more attention for their DC work (Superman – For All Seasons, Batman – Long Halloween), they’ve done 3 Marvel mini series together, and this one’s my favourite of the bunch. This is a throwback to the original swashbuckling era that Stan Lee originally envisioned for the character. It’s a fun look at the early years of the character, and Tim Sale’s work here is stunning, as always. Although this rarely comes up as one of the great DD stories, it’s quite good, and worth keeping. Next up: The Brian Michael Bendis years! This entry was posted in Comic Books and tagged Comics, Daredevil, David Mazzuchelli, Elektra, Frank Miller, Marvel. Bookmark the permalink.